Ski resort Grächen (1617 to 2868 m) is designed for family ski vacation, but also pleasantly surprised by his offer skiing mightier. 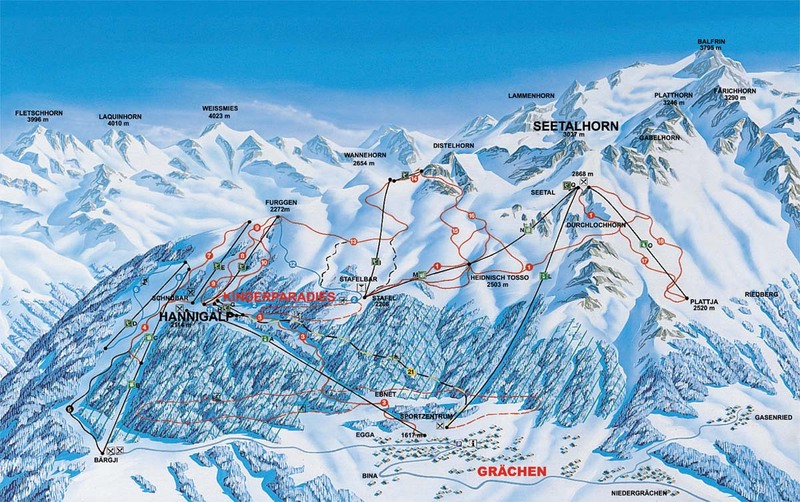 Almost 40 km of ski runs mostly on trails for advanced skiers Sted (31 km) is served by 5 lifts, 3 seats and 2 cabins. Guarantee of snow due to technical snow, children's park, ski school. Comfortable family headed by a complex of rustic La Collina is located on a quiet sunny spot in the Niedergrächen, about 2km from the center Grächen. Consists of the main hotel building and 4 apartment buildings. Railway Station St.Niklaus some 5.5 km (bus connections to Niedergrächen), Genf Airport about 300 kilometers. Cozy family-led hotel Eden is located in the center Grächen (some without passing cars). Shopping nearby. Railway Station St.Niklaus about 8 kilometers, the airport about 250 kilometers Genf. Altitude 1500 meters centers. Comfortable, rustic, family-led hotel La Collina is located on a quiet sunny spot in the Niedergrächen, about 2km from the center Grächen and shopping options. Consists of main and ancillary buildings (Uncategorized) hotel and 4 apartment buildings. Railway Station St.Niklaus some 5.5 km (bus connections to Niedergrächen), Genf Airport about 300 kilometers. Matterhorn Valley Hotel Desirée is located in the traditional mountain village of Grächen on the south side of the Alps, on the sunny side of the valley Matterhorn. Personally run hotel in the pedestrian zone in the center, accessible with elecromobile. Hotel Hannigalp in Grächen is located in the Swiss Alps near the Matterhorn Valley-u. It is situated in a quiet location, 300m from the center, has the atmosphere of friendly hospitality.